Have you noticed that your golf cart will not go as far when it is cold outside during the winter. Well, this happens to all golf carts with lead acid batteries. And there is little that you can do to improve run time. Golf cart batteries perform at their best when it is 80 degrees outside. At that temperature you will get the longest run time with the smallest amount of degradation to the cells of your battery. As the ambient temperature goes down so does the performance of your batteries. If you take your cart out for a ride when it is 0 degrees Fahrenheit your cart may only be able to travel for half the distance you would normally expect. Also, to some degree, you can expect the opposite with temps above 80 degrees. 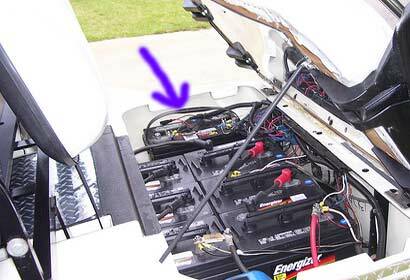 As the temps go up you may get slightly longer run times but it does more damage to the battery cells with each trip. This can shorten the like expectancy of the golf cart’s batteries. 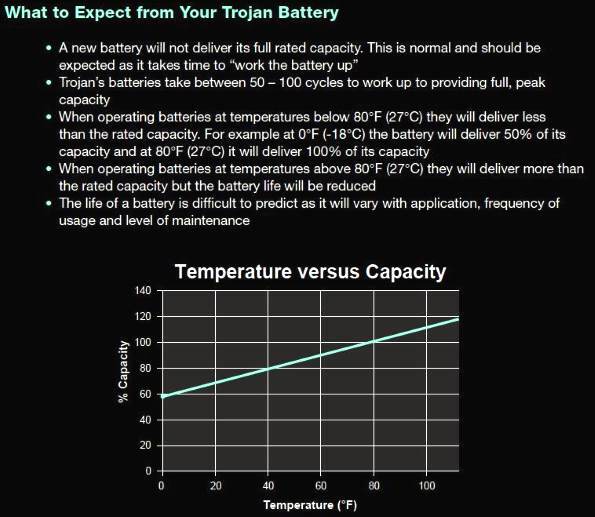 The chart below, that was put out by the Trojan Battery company, shows you what kind of results to expect from outside temperature changes.